Home » Home Page » S.A.M.A.A.P. The West Indian Museum of Panama was inaugurated by the Panamanian government on December 22, 1980, as a tribute to the West Indian immigrants who came to Panama to build the railroad and the Canal. 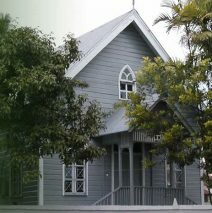 This Museum occupies the building which at one time was the Christian Mission Church, founded in 1910. The West Indian Museum, like most of the other museums in Panama, is a part of the government entity known as the ‘Patrimonio Histórico’ of the National Institute of Culture (INAC). The Society of Friends of the West Indian Museum of Panama is a civic non-profit organization, which has as its objectives to support and raise funds for the maintenance and extension of the work of the West Indian Museum of Panama. SAMAAP is also dedicated the social and cultural development of the Afro-Caribbean culture.